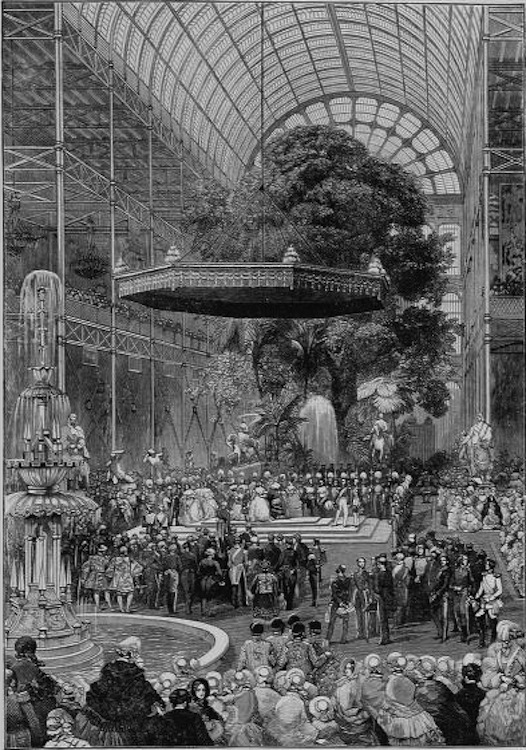 Opening of the Great Exhibition, Hyde Park. (After the Picture by Eugène Lamé.) Source: Life and Times, facing p. 482). Though some of the Royal Family, like the Duke of Cambridge, were afraid that there might be a riot on the opening day, the Queen was not affected in the least by their warnings, asserting that she had the completest faith in the good sense, good humour, and chivalrous loyalty of her people. Nor was this confidence misplaced. On the day of the opening, she was received with passionate demonstrations of loyal enthusiasm from the crowds, amounting in the aggregate to about 700,000 persons, who came forth to see her pass. As for those who entered the building, they seemed awestruck with astonishment at the brilliant scene, radiant with life and colour, which lay before their eyes. When the National Anthem had been sung. Prince Albert, at the head of the Commissioners, read their Report to the Queen. She in turn read a short reply. A brief prayer was offered by the Archbishop of Canterbury, and then the "Hallelujah Chorus" was sung. The grand State procession of all the dignitaries was then formed, and walked along the whole length of the crowded nave amidst deafening cheers. "Every one's face," writes the Queen in her Diary, "was bright and smiling, many with tears in their eyes. Many Frenchmen called out 'Vive la Reine!' . . . . The old Duke and Lord Anglesey walked arm in arm, which was a touching sight." When the procession returned to the point from which it started. Lord Breadalbane proclaimed the Exhibition open in the name of the Queen, whereupon there was a flourish of trumpets and more cheering. "Everybody," writes the Queen, "was astonished and delighted. Sir George Grey (Home Secretary) in tears." * Martin's Life of the Prince Consort. Ch.v. XLII. ** Prince Arthur, Duke of Connaught.